OST OF WHAT we need to know in life can be found in the words of Ubi Caritas. From this text, we learn strive for unity, love, and perfect charity in God’s ever-presence. However, it is the second line of Ubi Caritas that has some of the most interesting implications: “Congregavit nos in unum Christi amor.” Christ’s love has gathered us into one. True, we may be united in the love of Christ—but not necessarily in other things. Our differences may be vast. This is where the bounds of love and Christian charity are truly tested. Nothing raises the blood pressure of Catholics more than when discussion turns to music. Music deeply touches us personally, yet during the liturgy, we are engaged in a communal act of praise through music. The mass is a sung prayer. It demands that we sing His praises. Yet, we are frail in our humanity, and our individual passions run deep. The dualities of personal expression verses communal prayer don’t always overlap for every individual. Sometimes, this turns adversarial. Sometimes it gets ugly. My route to becoming an organist, composer of sacred music, and lover of Gregorian Chant has been quite circuitous to say the least. My education from chemistry major at N.Y.U. to the Berklee College of Music to organ studies with James David Christie of the Boston Symphony Orchestra frame my eclectic background. But it’s more than that. I have been an avid songwriter ever since my teenage years. It seems I spent half my life in the recording studio and the other half at church. With professional experiences working with talented artists with major label credits, I am very comfortable in my skin inhabiting these disparate worlds of music. For the most part, I have kept my songwriting (Click here for a sample. Enjoy photo with leather jacket) separate from my liturgical work, but that has not been entirely true over the years (including some notable exceptions.) This separation usually felt natural to me, as songwriting (lyric writing especially) is a highly personal outlet. But one important acknowledgment remains: Having taken the craft of songwriting very seriously, I have enormous respect for excellent songwriters. I know how hard it is. If it were so easy to write top-40 hit songs, as some suggest, then we all would be millionaires. However, I have been fortunate to have mentors who advised me to keep things positive in my public role. If only from a pragmatic point of view, such indiscretions are unwise and unprofessional. More importantly, absence of charity – especially ad hominum attacks – undermines one’s credibility. That a self-righteous derision of music and composers is exceedingly unchristian should go without saying. It is hurtful. (Ironically, I have experienced this from both ends of the liturgical spectrum.) Here is a thoughtful and well-written perspective on this topic by liturgical composer Rory Cooney. He speaks from a lifetime of experience. Therefore, I propose that as a Lenten fast, (and beyond) we abstain from such hurtful and divisive language. As Fr. Jonathan Gaspar states in this interview, “The sacrifices of Lent fortify rather than deny the spiritual lives of Catholics.” I should heed this advice. 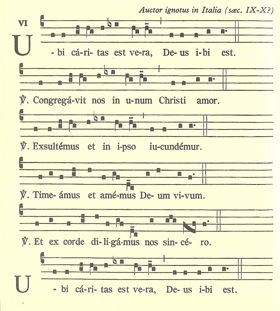 For if Gregorian Chant has “pride of place” as indicated by Sacrosanctum Concilium, I propose that it has such pride of place, not because of any decree, but because it has grown side by side with the Roman Rite, has lasted for well over a millennium, and lives and breathes today. As such, the vast treasury of sacred music of the Church has need of neither negative nor derisive comparison to boost its credibility. Its worthiness is inherent and stands on its own. Any lack of charity reveals only insecurity. Likewise, to dismiss entire genres of music as bereft of value is entirely without merit and rooted in ignorance. As professional musicians, it is our job to seek out new music that is valuable. If we must perform music we feel falls short, it is still our obligation to rehearse it with the same attention to detail one may give any other choral composition: attention to blend, diction, vowels, phrasing, reverence, etc. These are universal properties that can be applied to all music. It is our job sometimes to take something that may be less than ideal, and make it work well. A reality for most music directors is that very few of us have absolute autonomy. We have bosses. Even composers have editors and publishers to answer to. We deal in politics, preferences of various clergy, and with diverse congregations. This is especially true in the Archdiocese of Boston that has experienced parish closings and reconfiguration, just like many dioceses across the United States. When many of the faithful are in pain, patience with music is a pastoral necessity. But with it comes opportunities: it represents an exercise in humility. It sharpens both musical and communication skills. Patience and charity build up one’s credibility and trust among a congregation. Avail oneself of teaching moments in this process. Meanwhile, educate as much as possible and strive for the ideal. This is the calling of a lifetime! At times however, practicing charity does not preclude citing legitimate criticism. For example, those under my direction are keenly aware of my occasional exasperation with choral arrangements that are misaligned with the guitar chords and accompaniment. E.g., beautiful 4-3 suspensions in vocal parts that are not reflected in the accompaniment, I-IV-I progressions while the choir is singing a I chord throughout, awkward voice leading or vocal ranges that are difficult for professionals, no less volunteers. My exasperation lies in how simple it is to fix some of these problems, which we address during the rehearsal process. (This is a wonderful teaching tool!) These problems are not limited to any one composer or any one publisher. Sadly, I have found these editorial problems to be rampant, undermining the credibility of some potentially worthy music. Fortunately, I have the luxury of having several Berklee and conservatory students in my choirs. Without my even mentioning it, they will identify problem after problem even in styles of music they may very well be fond of. However, if an arrangement can’t pass muster from a second semester Berklee student, then it doesn’t belong in print. I’m not talking about avoiding parallel fifths or applying the principles of J. J. Fux. That would be stylistically inappropriate. Frankly, some editors have failed some very talented songwriters, and they have failed God’s people. They need to be held accountable because they can do far better — and they have! For example, a Craig Kingsbury arrangement of a Bob Hurd piece is sublime. Randall DeBruyn and Robert Batastini, of course do exquisite arrangements of liturgical songs. Michael Joncas’ most recent compositions defy genre. Steven C. Warner’s music has found a home in both the Notre Dame University Folk Choir and the St. Michael Hymnal—a rare accomplishment. Dr. Jerry Galipeau’s and World Library Publications’ thoughtful approach to the New Translation of the Roman Missal (as described by Adam Wood as the “servant model of composition” is a beautiful revelation and can be universally applied to all sacred music. Finally, as a lover of Gregorian Chant, polyphony, the pipe organ—as one who loves to chant the dialogues, and sing the propers, and I conclude with a final example of true Christian charity. In the early 1990’s, a Jesuit suggested a number of composers from whom to seek advice regarding publishing my music. Of the several I contacted, one took the time to speak to a 22-year-old, he neither knew nor needed to know. He spent about an hour on the phone with me. His name was Fr. Roc O’Connor, S.J. He showed an example of true Christian charity. Thank you, Fr. O’Connor for your wisdom, generosity, and selfless charity.